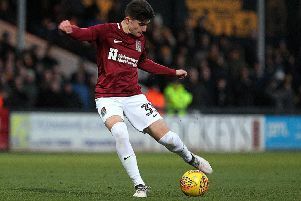 Home may not have been a particularly sweet place for the Cobblers in recent games, but fit-again Sam Foley can’t wait to step out on the PTS Academy Stadium turf again on Saturday. The 32-year-old’s most recent outing at home was in the highly encouraging 3-0 win over Carlisle United on January 12, but it’s fair to say pickings have been pretty slim for the home faithful since then. The combative midfielder was a very frustrated spectator for Town’s past three home games, that have seen the team booed from the pitch at the end. A tear in a disc in his back ensured he had to sit out the frustrating draws with lowly Morecambe and Crawley Town, as well as the chastening 4-0 hammering at the hands of Colchester United, but Foley is fit again now and in line to start in Saturday’s showdown with promotion-chasing Exeter City (ko 2pm). He returned to action a fortnight ago and played a key part in the on-the-road wins at Stevenage and Crewe Alexandra, and believes the team’s home form is only going to benefit from the confidence and belief gained from those victories. And Foley believes the secret to turning things around at the PTS is pretty simple - the team just needs to work harder to get the supporters right behind them. “I think we have shown away from home that it is that hard work ethic that is getting us through games and is getting us results,” said Foley. “For me, I have always enjoyed playing at home and the crowd gets right behind you if you can create that good atmosphere through your play. “Sometimes if you don’t do that then the crowd can turn, and that happens at every club, but we as a team thrive on that atmosphere when the fans get behind us. “When they do, it can benefit us, and I think Sixfields is a tough place to come for opposition teams. On the face of it, Town’s home form has hardly been disastrous anyway. The team have lost just once on home soil since early September, but the problem has been there have been too many draws (six in the past eight home games), and also, the odd game aside, there has been precious little entertainment on offer either. Asked why he feels the team has performed better away than at home, certainly since the turn of the year, Foley added: “There could be a number of factors. “At home, we know we are a good team, and sometimes that can be your downfall. “When you look at the opposition for what they are, it’s 11 v 11 and you have to roll your sleeves up and match them for everything, and then do more. Whatever happens against Exeter this weekend, Foley is just delighted to be playing again after suffering an injury that left him struggling to get around in every day life, never mind kick a football around. “I took a fall in the win over Carlisle at home, and I had a big inflammation in my lower back, and it took a couple of weeks for us to really find out what it was,” explained Foley. “We went to see a specialist and there was a tear in one of discs in my back, so I had an epidural which he said would sort me out. “That took a couple of weeks, and then the gaffer just thrust me back in which is what I would want, although it’s probably not good for my body. “But I just want to play and it was frustrating not being able to do anything for three weeks as I was in a bad way. “It took time to get things sorted out, but once it was done I just wanted to get back playing and the gaffer showed a lot of faith in me by throwing me straight in. “It was frustrating, but there was nothing I could have done. “It’s not as if I had a slight niggle or was not playing for a different reason, I literally couldn’t help them. Foley is likely to start in Saturday’s clash with Exeter, who are fifth in the division and have become perennial play-off contenders, losing the past two finals at Wembley. They are in a position the Cobblers would love to be. Town seem to at last be heading the right direction as they go into Saturday’s game off the back of a five-match unbeaten run, but Foley insists that means nothing this weekend. “The match is a good measuring stick for us,” said Foley. “It is a bit of cliche to say you are only as good as your last game, but that is the case. “We can forget all the games that have been and gone, we are off the back of a good win and a good performance, but Exeter is going to be a totally different challenge.